Jason Ricci is well known for having one of the most exciting, energetic, and unpredictable live shows on the circuit. His live performances are sweaty, sexual, and intense. 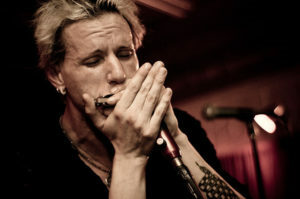 Ricci has been actively touring the Blues circuit in the USA and Europe for over twenty years and during that time has developed a unique and inventive harmonica sound that is without any doubt one of the most distinctive in the world today. The recipient of the Blues Music Award for top harmonica player in 2010, he has received multiple nominations over the years and has recorded and worked with renowned artists including Johnny Winter, Junior Kimbrough, RL Burnside, Nick Curran, Walter Trout, Ana Popovic, Cedric Burnside, Joe Louis Walker, Sue Foley & Peter Karp, JP Soars, Nick Moss, and many others. He appeared at the Rock & Roll Hall of Fame induction filling the role of the late Paul Butterfield when that band was honored. Love Ricci or hate him, through performing, singing, songwriting, teaching, harmonica playing — as well as his L.G.B.T.Q., mental health, and addiction activism — it is not an overstatement that this self-proclaimed young, white, queer, skateboarding, punk-rock loving, felon moon cat from Maine is currently changing the world through music and education. Jason Ricci rarely plays in Oregon and was recently part of Mark Hummel’s Harmonica Blowout in Portland. 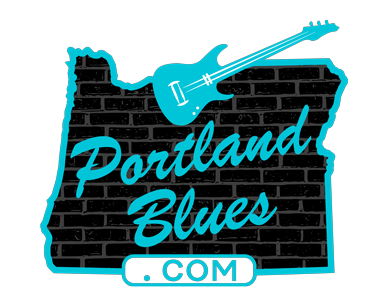 Now he returns headlining his own full performance for two shows with his band The Bad Kind in celebration of their latest release, Approved By Snakes, for two shows at The Birk, 11139 Hwy 202, in Birkenfeld, Oregon. On Saturday, July 22 for a 7:00 pm show and then on Sunday, July 23 for an afternoon show starting at 3:00 pm. Tickets are $15.00 advance through TicketTomato.com, or $20.00 at the door. Sunday’s show is open to all ages, with admission prices for children under 12 at $10.00 at the door only.